Our last Wedding Fair for the Spring was at Comlongon Castle, one of the loveliest venues near Gretna. The Fayre was very well attended and also saw the opening of the most stunning luxury honeymoon Lodge at Comlongon; surely a once in a lifetime experience for any one who stays there. We took along ten new cake designs as well as some novel cookie place name favour ideas. One of the most eye-catching Wedding Cakes on show was the Ribbon Cascade. 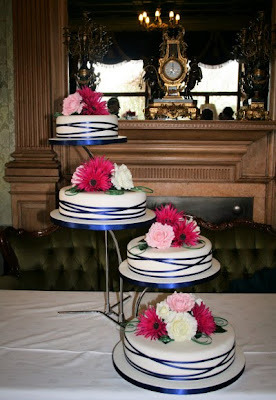 The cakes are simply finished with twists of ribbon and decorated with either fresh or silk flowers in any choice of colour scheme. The day flew by, we were so busy chatting to brides about their Wedding Cake ideas and taking bookings and there was the usual lovely atmosphere for which the Castle is so well renowned. So well done to all the Team at Comlongon for hosting such a successful and enjoyable event.